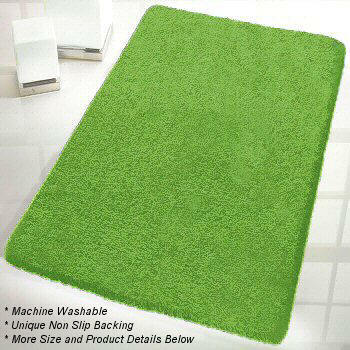 Plush solid color bath rug. Garnet Red: Striking deep red tone with dense high pile. Kiwi Green: Bright true green color. Marine Blue: Deep blue with a soft tone. Sand Beige: Elegant light brown tone beige. Grey: Soft medium tone grey. Very soft pile and a beatiful grey color. Slate Grey: Striking deep dark grey color. Fantastic accent color for any bathroom.